Foreword. Damage Mechanics. Continuum damage mechanics of composites: towards a unified approach (J.L. Chaboche et al.). Space of damage conjugate force and damage potential of elastic-plastic-damage materials (K. Hayakawa, S. Murakami). Kinematics of large elastoplastic damage deformation (G.Z. Voyiadjis, T. Park). Scale and boundary conditions effects in elasticity and damage mechanics of random composites (K. Alzebdeh et al.). The effect of fiber bridging on self-similiar crack growth: a penny-shaped crack evolvement in a unidirectional, fibrous composite (Kai X. Hu et al.). Crack-tip singularity in damaged materials (Y. Liu, S. Murakami). Micromechanics of fatigue crack initiation of single crystal under plane strain (T.H. Lin et al.). The sliding crack model revisited (M. Basista, D. Gross). Damage evolution rule for multiaxial variable loading (Z. Mroz, A. Seweryn). A micromechanical damage model of fiber composites with nonlinear interface: bulk, tension and compression response (Z. Dong, A.J. Levy). Localization and Damage. Dynamic localized fracture in inelastic solids (P. Perzyna). Macromechanical description of micro-shear banding (R.B. Pecherski). Some remarks on gradient and nonlocal damage theories (R. de Borst et al.). Catastrophic slip phenomena in crystalline materials (A. Korbel et al.). Damage in Brittle Materials. A comparative study of isotropic and anisotropic descriptions of damage in concrete structures (S. Fichant et al.). Advanced thermomechanical constitutive models for airfield concrete pavement under high temperatures (J.W. Ju, Y. Zhang). Mechanical behaviour of thin-film coating/substrate systems under nanoindentation (J. Li et al.). On the continuum description of damage in fiber-reinforced composites (D. Boudon-Cussac et al.). A mesocrack damage and friction coupled model for brittle materials (A. Dragon, D. Halm). Anisotropic damage model for the triaxial creet behavior of plain concrete (E. Papa, A. Taliercio). Damage and fracture modeling of 4D CC composites (P. Ladeveze et al.). Damage in Metals and Metal Matrix Composites. Prediction of damaged behavior and failure of a metal matrix composite using a multiscale approach (K. Derrien et al.). Effect of microstructural architecture on flow/damage surfaces for metal matrix composites (C.J. Lissenden, S.M. Arnold). Calibration and validation of an anisotropic elasto-plastic damage model for sheet metal forming (A.M. Habraken et al.). Modeling of oxidation and its effect on the crack growth resistance of titanium alloys (D.C. Lagoudas et al.). A first step toward functionally graded plasticity in porous materials (K. Ding, G.J. Weng). Computational Damage Models. Modeling of delamination using a layerwise element with enhanced strains (C.M. Dakshina Moorthy, J.N. Reddy). A computational damage mechanics approach for laminates: identification and comparison with experimental results (P. Ladeveze et al.). Damage in Polymers and Elastomers. Damaged hyperelastic solid with an induced volume variation. Effect of loading paths (K. Saanouni et al.). A micromechanics approach to predict strength & stiffness of polymer matrix composites (A.G. Caliskan et al.). Author Index. 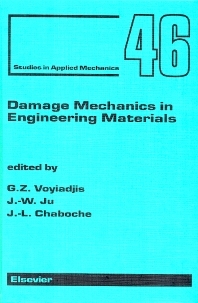 This book contains thirty peer-reviewed papers that are based on the presentations made at the symposium on "Damage Mechanics in Engineering Materials" on the occasion of the Joint ASME/ASCE/SES Mechanics Conference (McNU97), held in Evanston, Illinois, June 28-July 2, 1997. The key area of discussion was on the constitutive modeling of damage mechanics in engineering materials encompassing the following topics: macromechanics/micromechanical constitutive modeling, experimental procedures, numerical modeling, inelastic behavior, interfaces, damage, fracture, failure, computational methods. Study of damage mechanics. Localization and damage. Damage in brittle materials. Damage in metals and metal matrix composites. Computational aspects of damage models. Damage in polymers and elastomers. For engineers and researchers interested in both theoretical treatment and experimental investigation of damage in materials. George Z. Voyiadjis is the Boyd Professor at the Louisiana State University, in the Department of Civil and Environmental Engineering. This is the highest professorial rank awarded by the Louisiana State University System. He joined the faculty of the University of Louisiana State University in 1980. Voyiadjis’ primary research interest is in damage mechanics of metals, metal matrix composites, and ceramics with emphasis on the theoretical modeling, numerical simulation of material behavior, and experimental correlation. Dr. Voyiadjis’ research has been performed on developing numerical models that aim at simulating the damage and dynamic failure response of advanced engineering materials and structures under high-speed impact loading conditions. He has over 164 referred journal articles and 14 books (8 as editor) to his credit. Over forty graduate students (21 Ph. D.) completed their degrees under his direction. He has also supervised eleven postdoctoral associates. Voyiadjis has been extremely successful in securing more than $8.0 million in research funds as a principal investigator from the National Science Foundation, the Department of Defence, the Air Force Office of Scientific Research, the Department of Transportation, and major companies such as IBM, and Martin Marietta. He has been invited to give theme presentations and lectures in many countries around the world. He has also been invited as guest editor in numerous volumes of the Journal of Computer Methods in Applied Mechanics and Engineering, International Journal of Plasticity, Journal of Engineering Mechanics of the ASCE, and Journal of Mechanics of Materials. These special issues focus in the areas of damage mechanics, structures, fracture mechanics, localization, and bridging of length scales. He is currently a Fellow in the American Society of Civil Engineers, the American Society of Mechanical Engineers, and the American Academy of Mechanics.